this pillow was the perfect match to fit with my other pillows! 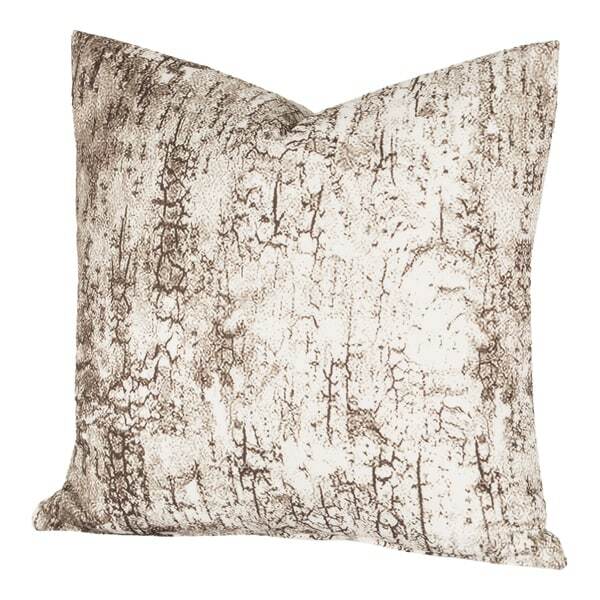 This detailed pillow cover resembles natural birch bark for a picturesque touch. Bring the beauty of nature into your living room with this enchanting throw pillow, with knife edging, a zipper closure, and machine washability. Perfect throw pillow, for any room! Feels amazing! This was one of the best purchases I have made in a while. The pillow complimented the entire room. They look great and my brown couch. They are soft to the touch,plush and very comfortable. Even my husband commented on them ,that he likes them better than the pillows that were on there before. This pillow has wonderful texture and neutral colors, it goes great with my dark brown couch. The material is soft enough but the pillow itself is super firm and i also expected to be a little more brown, there is a khaki green coming through. It is definitely well made. Very good quality and the design is beautiful!! Very full pillows with good design. Looks nice against a dark brown sofa. No issues with construction after a year of use. Comfortable. Love these pillows! Great quality and really cute too!!! It is unique as well as comfortable. "To these pillows have any sheen to them?" Not really a sheen, but they are not totally matte, either. I love the way they look and can be dressy or casual.